Beyond the Ivy offers everyone fun, convenience and a lot of value for the dollar in a family friendly environment. 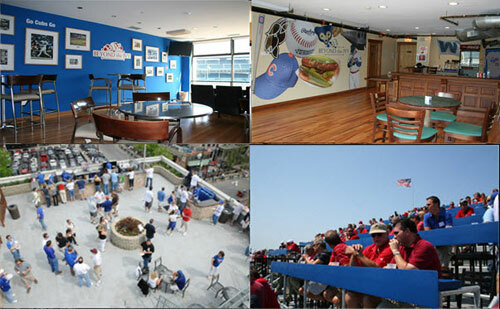 Recently renovated buildings offer fun in the sun with Beyond the Ivy’s unique, eating-station bleacher systems. There are no assigned seats so everyone can mix and mingle with plenty of room to visit in the bleachers and in the shade. If an inviting indoor bar is more desirable, then hang out on the third floor of each building in an air conditioned elite sports bar with great dramatic views of the game through floor to ceiling picture windows and large screens of the game everywhere. Beyond the Ivy offers quick and convenient access from Waveland Avenue to all three of its locations with both access to private parking and public transportation located nearby. Avoid all the crowds and confusion of the ball park without missing any of the excitement of the game. Enjoy flexible seating. Avoid the lines with bathrooms that are clean, posh, quick and convenient to use. 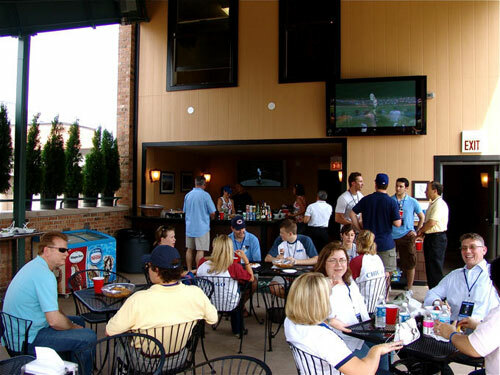 Unlike the ball field, your single admission price to Beyond the Ivy provides your game experience, beverages (including select beers, select wines and soft drinks) and unlimited appetizers, entrees and desserts with a large and varied menu of popular Chicago summer fair served over the course of the game. Enjoy seasonal salads, grilled meats, snacks, cookies, brownies and more. Vegetarian items are available on request. 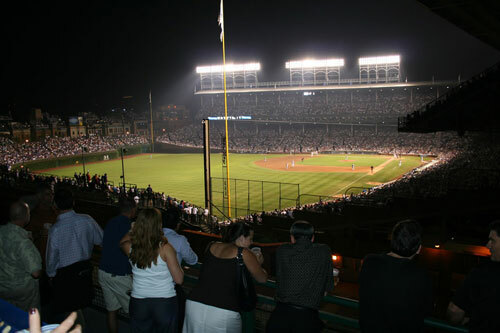 The action is great and the excitement is thrilling when you experience a Cubs game from a Beyond the Ivy rooftop. It’s like an open air skybox but at an affordable price with all the food and drink amenities you’d find on a luxury cruise. Whether you have a small group or want to throw a large private affair, Beyond the Ivy staff are experts at providing a memorable experience and making everyone comfortable. Tired of the usual golf outing or nightclub mixer to raise funds for your worthy cause? Why not hold your fundraiser with Beyond the Ivy and provide a new, memorable experience that is appropriate and fun for people of all genders, ages and backgrounds. Beyond the Ivy has worked with dozens of alumni, charitable and political fundraising groups over the years to successfully raise significant dollars for worthy causes. With three rooftops and the ability to comfortably entertain 200 guests at one time Beyond the Ivy is a perfect partner for your organization. Tours of the facilities can be arranged by prior appointment. A rooftop event is a memorable way to thank and entertain your employees, partners and clients. Stand out from your competitors by offering something different and universally appealing. Beyond the Ivy hosts hundreds of corporate events each year from small intimate groups to exclusive events held on an entire rooftop. Beyond the Ivy is one of the few rooftop operators able to comfortably accommodate up to 200 guests at a single rooftop event. Beyond the Ivy prides itself on working with guests for special event requests from decorations to dining. If you have a need for meeting space, the third floor bar area at any Beyond the Ivy locations can be set up with a podium and seating in place prior to a game for speakers, large group meetings and group toasts with prior arrangement. Beyond the Ivy works with local parking services to coordinate reserved parking for event VIPs when requested. Better yet, let Beyond the Ivy arrange limo services to make getting to and from the event seamless. Are you celebrating? Speak to Beyond the Ivy about upgraded food packages to provide special beverages or elite foods to your event. If you have a larger gathering, an entire rooftop can be reserved to create a completely private event. For shared rooftop events, Beyond the Ivy discreetly screens the guest lists to make sure any competitors aren’t attending your same venue; just let Beyond the Ivy know your concerns. Your successful business event is Beyond the Ivy’s ultimate goal. Tours of the facilities can be arranged with prior appointments. 3639 Wrigley Rooftop is located at 3639 Sheffield Avenue. 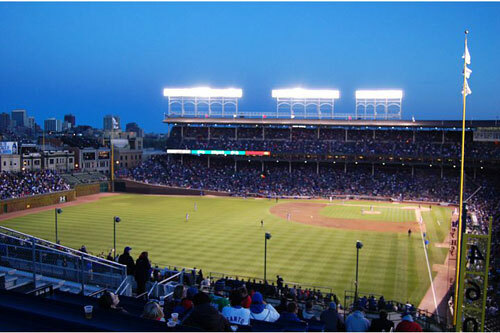 Positioned in right center field, 3639 ensures that all guests will not only enjoy an unobstructed view of magnificent Wrigley Field, but are close enough to feel as though they are part of the action. 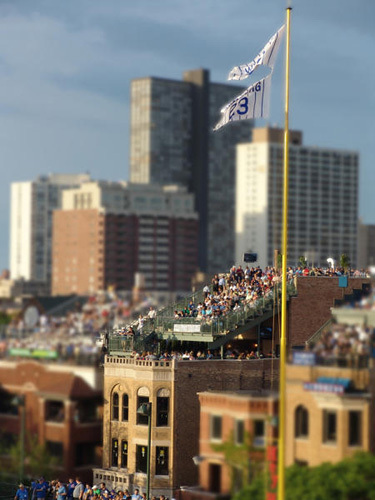 With a state of the art facility geared toward food, fun and baseball, a staff dedicated to your needs, and the best view any rooftop has to offer, 3639 is the premier rooftop at Wrigley Field. 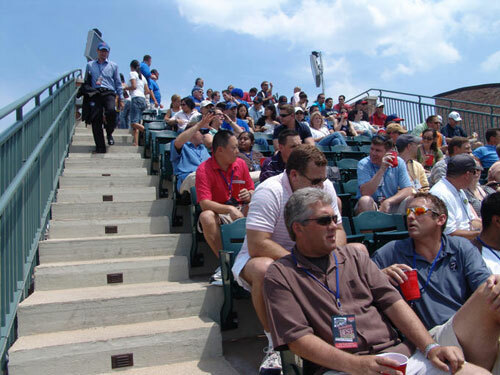 A ticket to 3639 ensures you a care free day of baseball, unlimited food and beverages, as well as the support of our staff in planning and executing your memorable event. Specializing in large company outings, birthday parties, and family trips to the ballpark, 3639 is perfect for any occasion. The atmosphere is second to none and our passion to exceed guests’ needs is what sets 3639 apart from the rest. 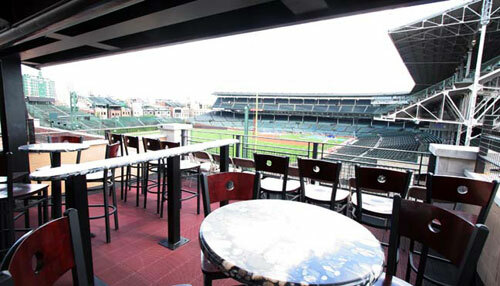 Outdoor Patio: Looking for a shady spot where you can still cheer with the fans at Wrigley? Enjoy 3639’s 4th level covered terrace. Featuring HDTV’s with game sound, a full service bar, even more food, and umbrella tables, this spacious level is perfect for guests looking to enjoy a burger hot off the grill, an icy cold beverage, and a pleasant conversation. Rooftop Level: Want to be in the middle of the action? Experience 3639 at its best on the 5th level. 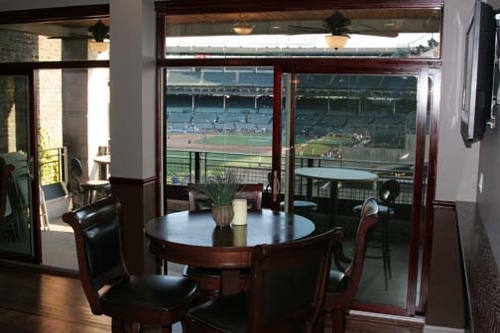 Featuring an unrivaled view of Wrigley Field, a full service bar and grill just steps away, and stadium seating, there is no better place to watch a game. A family owned and run rooftop, 3639 knows that every event, no matter the size, is equally important. With the assistance of our staff, planning an event has never been easier! Steve Alexander, the general manager, has been a part of the family at 3639 for six years. He will help you plan every detail of your event so that on game day, you can relax and enjoy the outing. Also, the experienced staff at 3639 will assist you in every way as to ensure your guests have the best experience on any Wrigley Rooftop. 3639 ensures your guests will not only enjoy a great day of Cubs baseball, but are part of an unforgettable experience at Wrigley. 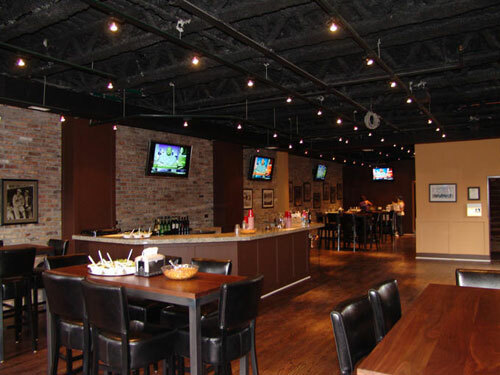 • Dozens of 35"- 60" HDTV's on every level, even a TV in the floor! • An Elevator off our lobby area. 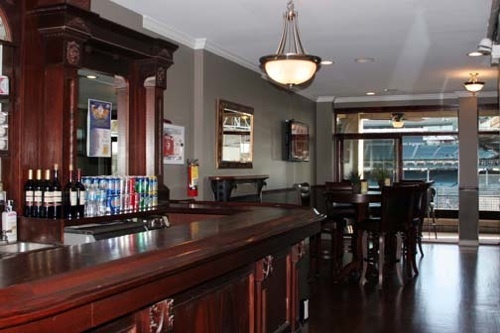 • Interior Clubroom that is climate controlled with bar seating. • 2 Large open decks area with café tables & lounge seating. • Private meeting space is available...ask for details. • Complete catering service included in price. • Guests can arrive an hour prior to game time, and can stay a half hour after the game ends. Originality: Brixen Ivy has no affiliation with any other rooftop. 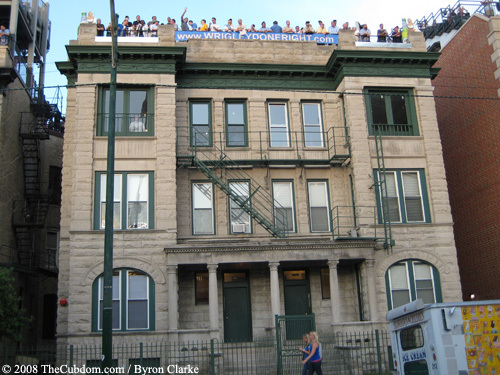 Brixen Ivy was the original rooftop building built from the ground up to actually cater to Cub fans, and we take our role as a leader seriously. We understand that many of the rooftops have similar names and some have multiple rooftop buildings. For this reason, we ask you to be sure you have contacted Brixen Ivy at 773-472-7889 or brixenivy@aol.com to book your event. Be sure you are at Brixen Ivy, 1044 West Waveland. Quality & Innovation: It all begins with a great idea. 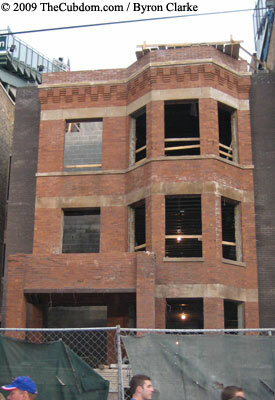 In 2009, Brixen Ivy Rooftop underwent a massive construction and renovation project. The new design takes into consideration the need for exceptional viewing and comfortable networking and socializing. The newly remodeled Brixen Ivy rooftop is quickly becoming known world wide for its stylish décor, inviting ambience, warm hospitality and state of the art facility. Exclusivity: Ideal for corporate customers. Because our guests prefer exclusive entertainment areas, we have multiple private deck and bar areas to choose from or combine. We believe the key to a successful outing is the ability to customize your event. Brixen Ivy offers choices and options. If you want something you don’t see here, simply ask. We will make every effort to accommodate your group. Community: Our philosophy At Brixen Ivy is about giving back. We strongly believe in building into our local and world communities. That’s why 25% percent of our profits go to organizations that facilitate after school programs, educational scholarships and supporting our troops and their families. Service: At Brixen Ivy, each customer matters. Whether you are part of a large corporate group or a small family party, you are important to us. The friendly and professional staff at Brixen Ivy is here to provide you with excellent service. Whether you’re all about watching the baseball game, a casual day out with friends, networking with colleagues, or closing the deal, Brixen Ivy is here to set the stage for you. Brixen Ivy’s Club Level - Ideal for groups of 25-40. The upscale atmosphere is the perfect setting to host your corporate clients. It is a combination of open air, outdoor balcony seats with indoor tables and seating. Hardwood floors | Large Mahogany Bar | 2 Bathrooms | 5 Flat Screen TV’s | Adjacent food service area At Brixen Ivy you will never have to worry about an overcrowded rooftop game. The ultimate in Chicago Rooftop experiences. Exclusive and open air with a large section of stadium seating. • Over 8000 sq. ft. There are three Wrigleyville Rooftops buildings. One is left-center field, one in right field, and one in foul territory in right field. All three rooftops offer food and drinks and have indoor suites. 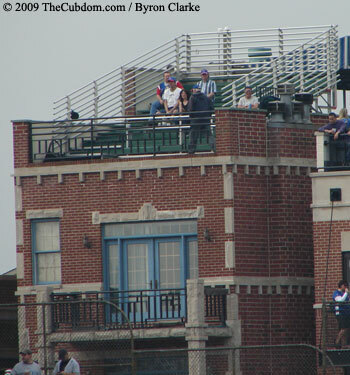 I had the opportunity to catch a game in 2012 from the 3643 N. Sheffield Rooftop, and it was a beautiful facility, and the Cubs won. So I've got good memories from that game. 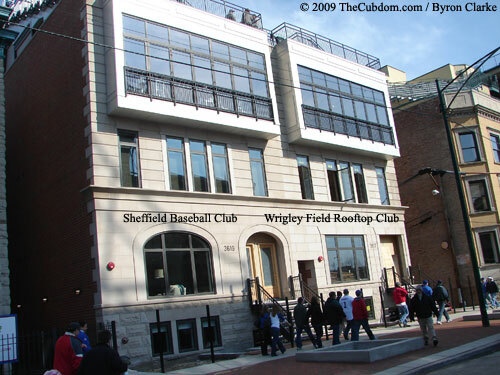 The Wrigley Field Rooftop Club, along with its sister rooftop, the Sheffield Baseball Club, were completed in the 2008 season. The building is very large and blocks the gap that used to let people watch the game from the Red Line El stop. The building is quite nice looking, but is located in right field foul territory. I've never been on top of the building, but you can smell the barbeque. For those who've attended a baseball game, if you ever notice the grill smoke that wafts out toward Wrigley and causes a spike in sales for the Hot Dog vendors, well that good smelling stuff comes from the Sheffield Rooftops, and it seems like most comes from the Sheffield Baseball Club and Wrigley Field Rooftop Club. The Ivy League Baseball Club reopened in recently after an extensive renovation. I've never been in the building, although it looks pretty nice post-renovation. Pictured above, the rooftop during renovation in 2009. Image from the Cubdom Photo Gallery, text is from my own observation and opinions. The Lakeview Baseball Club is home to the famous Eamus Catuli sign. (Eamus Catuli is latin for Let's go Whelps... but essentially means, Go Cubs!). The other sign (in this picture as AC0063100) stands for Ano Catuli 00 63 100. Ano Catuli means, "In the year of the Cub" the first two digits are how long it's been since the Cubs won a division title. The second set of two digits are for how long it's been since the Cubs won the NL Pennant, and the final numbers (now three digits) are for how long it's been since the Cubs won the World Series. 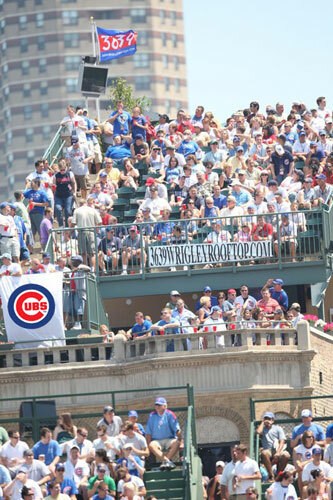 Unlike the other rooftops, The Lakeview Baseball Club is a private club, and so guests may need to join the club to purchase rooftop tickets, but in return the ticket prices may be lower than the other rooftops. The Lakeview Baseball club is located next door to the building with the Miller Lite billboard. I've also traded emails with owners/operators of this rooftop, and they were quite pleasant. Please check with the Lake View Baseball Club for information on rooftop ticket prices and availability. 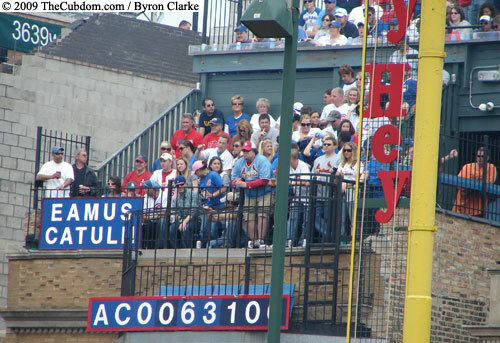 Murphy's rooftop is located beyond the right center field wall and has the smallest capacity of all the rooftops. 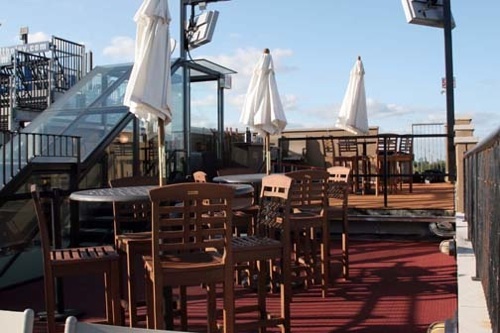 This makes it an ideal location for small groups looking to book an entire rooftop for their use. I've never been up on the rooftop, but I've thrown a few back at Murphy's bar next door, and I've always had fun there. The Murphy's rooftop building is the one with the light-up Harry Caray and is one of the more attractive buildings to look at, IMHO. Please check with Murphy's Bleachers for information on rooftop ticket prices and availability. Wrigley View's building was built in 1999 as the Rooftop by the Firehouse. 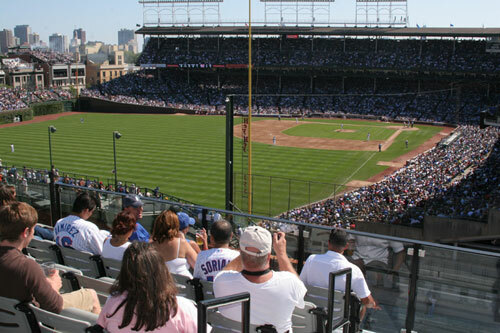 In 2009, Wrigley View opened to the public. 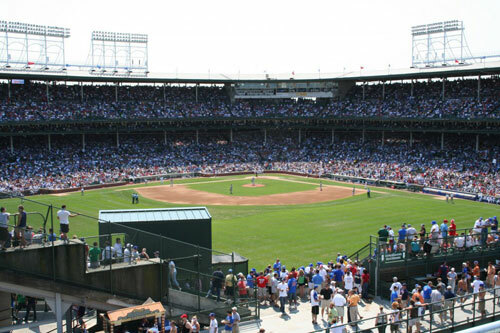 It is located next door to the famous and historic Wrigleyville Firestation, so the view is from left field foul territory. I've never been up there to see a game, but I think it would be fun. I can remember when the building was constructed. That summer, WGN kept showing all the construction workers taking breaks to watch the game. It always made me jealous, and the building is very beautiful, it has these turquoise blue highlights that completely pop out at the eye. I think it's the nicest looking building of all the rooftops. Another nice thing is that you could chat with the firemen next door who sit out on a bench and watch the folks playing catch on Waveland during the game. Please check with Wrigley View for information on rooftop ticket prices and availability. Down The Line rooftop opened mid-season 2010. I've been to this building under previous management and the building has fewer amenities than some of the surrounding venues. (I haven't yet met the current management, and it's possible they've remodeled). The building only had three bathrooms and no elevator, but the view from the third floor is pretty good and the rooftop view is great as they are literally "Down the Line" in right field, straddling the foul pole. Image from The Cubdom photo gallery. Be sure to visit the Waveland Avenue and Sheffield Avenue Rooftops pages to see street level photos of the rooftops, the Wrigleyville Firestation, the famous firehydrant, the Budweiser building, and more. To contact me, please email me at byron@thecubdom.com. Please note that I do not recommend specific rooftops, nor do I have information regarding ticket availability or pricing. 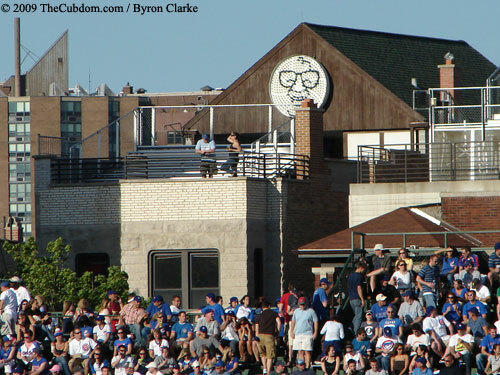 3639 Wrigley Rooftop, Ivy League Baseball Club, Sheffield Rooftop Club, Wrigley Field Rooftop Club, Skybox on Sheffield, Beyond the Ivy, Wrigleyville Rooftops, and BrixenIvy are official sponsors of The Cubdom. I will occasionally forward emails to their sales staff if I think they're a good fit for your request.